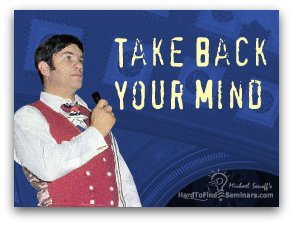 "How To Take Back Your Mind A Challenge To America"
The man who gave this Take Back Your Mind Speech took $5,000 and turned it into $300 million in five years. He netted over $30 million, created over 800 millionaires, and has created over 78 corporations. How did he do it? It all started with this message. This short nine minute recording will be the most amazing audio presentation you ever hear. Or it can be the worst. It's about how how to get your attitude right. It's about how to take back your mind. It's a challenge to America. It's about believe and faith. Faith in your self. It's the shortest audio recording on my site, yet what I believe to be the most powerful out of all 157 hours. This message has been used to motivate thousands of people all over the world. It is recognized as one of the most dynamic motivational talks ever made. I hope it will inspire you to listen to many of my other audio recordings. I hope it will give you the courage to believe in your self. Here is one of my most fascinating interviews ever. It's with Glenn Turner. It me interviewing Glenn Turner like he's never been interviewed before. Glenn in considered one of the most dynamic and charismatic speakers of our times. He's was the Toney Robbins of the 1970s. This interview is the fascinating real life case study of how a man with a physical disability, no money, and no confidence had the courage to build himself into a wealthy, greatly respected man who was, and still is a role model to thousands of people. But it is not just a rags to riches story. It contains valuable lessons in honesty, tenacity, humor, and respecting others you’ll take to heart. Glenn Turner was born in 1934 in South Carolina to an unwed mother. He was very poor. His mother’s prenatal illness of scarlet fever caused Glenn to be born with a clef palate and a hair lip. As an infant, he had surgery in an attempt to correct these problems. Even so, his disability was always noticeable. He dropped out of school in the 8th grade mainly because of the teasing about his hair lip by other children. When he was only 17 years old, he had his father sign for him so that he could join the Air Force. Unfortunately, he was given a medical discharge one year later because it was discovered that he had a perforated eardrum. Upon exploring job opportunities, he was told that his outlook was bleak because he had no education. He was directed to and enrolled in an Opportunity School. This was a school for people who had dropped out of school or had never gone to school. This school saved his life. It gave him the inspiration to complete school and the first boost of confidence in his life. Glenn eventually started selling sewing machines door to door. Because of his past experiences, Glenn didn’t have much confidence at first. However, he was fortunate to have the ability to learn about sales from his manager who became his mentor. This mentoring relationship helped Glenn to be very successful. Glenn never forgot the importance of having a good mentor. He was soon introduced to Holiday Magic, an MLM cosmetic sales company Glenn was mortgage the family furniture to borrow $5000 to become a distributor. In short time, Glenn surpassed fellow distributor, Zig Ziegler, and became the Number One distributor for Holiday Magic. In fact, he made a quarter of a million dollars just in his first eight months with Holiday Magic! Glenn reveals how he transformed from having little confidence to having the confidence of a master speaker and entrepreneur. When Glenn was 26, he left Holiday Magic and began his own cosmetic MLM marketing company. It was called Koscot. Hear how Glenn grew Koskot to a $100 million dollar powerhouse in just 36 short months. Listen how Koscot was organized and how it ran. At the height of it’s growth, Koscot was larger than Amway. Glenn developed a new company named Dare To Be Great because Koscot had a need for training materials and courses. Many Koscot salespeople left their distributorships and became involved with the Dare to be Great program. People flocked to Dare To Be Great because they were fascinated with everyone’s positive attitude and success. In fact, Glenn estimates that more than 800 people became millionaires through Koscot and Dare To Be Great. MLM laws were non-existent when Glenn first started. But as the laws developed, Glenn started being investigated for different kinds of illegal activities, including mail fraud. He subsequently worked with one of his former employees in the development of a new MLM, Challenge America. The company was investigated and Glenn was eventually charged with “aiding and abetting a pyramid.” He spent almost five years in an Arizona prison. In this interview, you’ll hear Glenn discuss his experiences in prison. Glenn’s real passion is teaching personal development and the importance of maintaining a positive attitude. He has written several books and estimates that he has sold seven million books and audio-tape programs in his career combined. Listen as Glenn gives advice on how to protect themselves. He says that he made the mistake of not protecting himself because he was always being honest. Because of lawmakers and the legal system, simply being honest was not enough. This interview is an absolute gem! Glenn proves how a person can go from rags to riches and from ruin to recovery through the power of positive thinking and honesty.